Langley Bowls Club is a friendly lawn bowls club situated within the sports and leisure centre in Hawksbrooks Lane, Beckenham (opposite the Langley Boys and Langley Girls Schools). 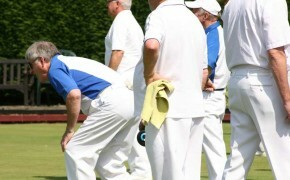 Both the ladies and men take part in the North West Kent leagues on Thursday evenings. The men also play in the over 60’s LX league. We also have friendly matches against other clubs both at home and away on weekdays and weekends. There is a club session every Friday night for an informal game amongst ourselves followed by an evening of socialising. New and experience bowlers alike are welcome to join us on these evenings. There is no need to pre-book. Just turn up. New bowlers will be given coaching (you only need to bring flat soled shoes or trainers). For more information please contact Graham Bellwood (men’s captain) on: 0208 650 6540/07986 498 950 or Pam Gowland (ladies captain) on: 07552 187 801.